Millennials – that alternately praised and despised generation of 18-to-34-year-olds born between 1982 and 1998 – might have less brand loyalty than their predecessors, but they actually use Facebook less and are more responsive to e-mail campaigns, according to a new study by New York City-based marketing firm Fluent LLC. Released this month, the study, “Marketing to Millennials 2016,” discovered that while Facebook remained the top social network across all demographics, with 43 per cent of all millennials and 61 per cent of respondents over 34 citing it as their preferred social network, younger millennials – those aged between 18 and 24 – were nearly as likely to log into YouTube, Instagram, and Snapchat on a daily basis. Other findings were less surprising, such as the fact that 87 per cent of millennials own smartphones (as did 87 per cent of respondents over 34), that 51 per cent spend all or most of their online time on them, and that a majority own a computer and tablet device as well (68 per cent and 59 per cent, respectively). Naturally, such results are a precursor to Fluent’s true reason for conducting the study, which surveyed 1,769 millennials and 1,191 non-millennials across the U.S.: identifying their levels of engagement with digital channels, and in this respect, the respondents did not disappoint. For example, the researchers discovered that millennials were slightly more likely to use their computers to make online purchases on a weekly basis, and slightly more likely to use their smartphones on a monthly basis. Meanwhile, 45 per cent had used tablet devices to make at least a few online purchases over the past year, while 36 per cent had used a smartwatch. Arguably the most surprising finding, however, was the apparent influence of digital channels on millennials’ purchase decisions. Contrary to conventional wisdom, the researchers wrote in the report, millennials were no more likely than their older counterparts to ignore promotional emails. In fact, the opposite was true: Millennials were 10 per cent more likely than respondents over 34 to say promotional emails affected their purchase decisions all or most of the time. In fact, 68 per cent of millennials said their purchase decisions were affected at least occasionally by promotional emails, while 63 per cent said the same of online ads, and 56 per cent of promotional text messages. 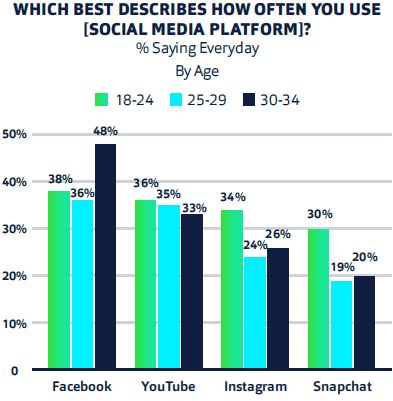 In addition to the report, Fluent released an infographic breaking down the influence of the four leading social media networks among millennials. Check it out below (click for a larger version).